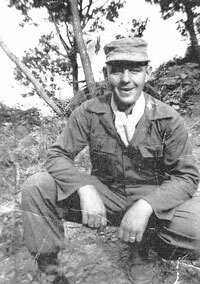 During the Korean War, Richard Mielke of New Germany served as a medic specialist E5 in the US Army. He joined the American Legion Post 601 in New Germany in June 1954. His story, along with many others, is recorded at www.ccvmr.org. After five years of meticulous preparation, the Carver County Veterans Memorial and Registry (CCVMR) is about to become a physical reality. As of the end of August, the parking lot and sidewalk had been constructed, cement was being poured, and landscaping was ready to go in. “Basically, the groundwork is all done,” Heldt said. The lighted memorial will be located just off Highway 25 and County Road 30. Consisting of six granite stones, it will be about 40 feet long and 11-12 feet high. There will also be a panel dedicated to honor prisoners of war and soldiers who were killed in action, an American flag, and one flag for each branch of the military. Other planned features include meditation benches, a glass display case, and 8-by-16-inch paver stones for individual veterans, featuring their name, branch of service, and era in which they served. About 300 pavers have been sold so far. Veterans don’t need to be from Carver County in order to be included. The memorial will be filled with symbolism, and each panel will include images of items soldiers would have used. The images have been approved by the committee, and are now in the process of being authenticated. Heldt said they are working with historical experts in an attempt to catch any inconsistencies. Images of soldiers will also be featured. To make the images unique and authentic, the CCVMR committee conducted photo shoots with real soldiers. Out of nearly 1,500 photos taken, the top six were selected. From there, a graphic designer touched up the images and got them ready for display. The CCVMR has been working with Coldspring, a natural stone manufacturing facility and bronze foundry in Cold Spring (near St. Cloud). Veterans’ stories are preserved in an online registry at www.ccvmr.org. Anyone who served in the US military and was honorably discharged can purchase a paver and submit a story. (Purchases are fully tax-deductible.) To find a veteran’s story, go to www.ccvmr.org and type the person’s last name in the “search” box. The idea for an online registry came about after Heldt was looking for a way to preserve information about his twin uncles from Waconia, Milfred and Willard, who served in World War II. Their story has several paragraphs of detail, noting that the identical twins began active duty Aug. 3, 1942, shortly after celebrating their 22nd birthdays July 20. Anyone wishing to reserve a paver, to donate, or to learn more about the Carver County Veterans Memorial and Registry, may call 612-888-6366, or Stan Heldt at 952-657-2169.